Since the launch of the China-Europe Railway Express (CR Express) linking China with Europe by fast-track cargo rail, freight volume has increased substantially, particularly in the past year. The CR Express is of increasing interest to companies wanting to transport Chinese products to Europe while tapping markets along the Belt and Road routes, including manufacturers in western China and companies in the coastal region looking for an alternative to sea freight. Some companies even take advantage of these freight trains’ speed and customs clearance facilitation to bring imports into the booming domestic market. 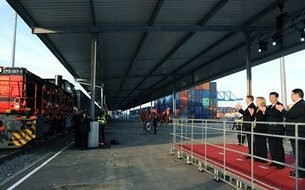 President Xi Jinping at Yuxinou express train terminal at Duisburg in Germany in 2014. Yuxinou express train terminal at Chongqing railway port. China’s Europe-bound freight-train service (now formally named the CR Express) was launched in March 2011, with the first train setting off from Chongqing to Duisburg, Germany. As of August 2016, more than 2,100 trains had been dispatched via the Yuxinou (Chongqing-Xinjiang-Europe) International Railway. Currently, the CR Express provides regular rail services to at least 16 Chinese cities, including Chongqing, Chengdu, Zhengzhou, Wuhan and Suzhou, calling at more than 12 cities in eight European countries. Of particular interest is the fact that CR Express services have grown rapidly in the past year, with increasing numbers of mainland companies relying on rail to transport goods to Europe. The CR Express provides not only direct railway transport to Europe from China, but also a one-stop service in cargo inspection, quarantine and customs clearance thanks to the support of relevant government authorities. Notably, the technical specifications of the railway system and rail tracks are different between China, countries in Central Asia and Europe. Trains need to change from one rail track system to the others when crossing the China-Russia border, entering Central Asia (countries such as Kazakhstan), and arriving in Eastern Europe and Western Europe. However, such technical issues have been resolved thanks to the concerted efforts of the railway and shipping companies concerned. Today, most logistics operators are capable of monitoring the cargo during the whole process and provide the consignor with clearance on arrival at the railway terminus, warehousing and transshipment to the desired destination. Chongqing launched the first Europe-bound freight-train through railway service, via the Yuxinou (Chongqing-Xinjiang-Europe) International Railway, in March 2011, departing from Chongqing, passing through Alashankou in Xinjiang, crossing Kazakhstan, Russia, Belarus, Poland, and finally reaching Duisburg in Germany. Covering a distance of about 11,179km and taking about 14 days, the Yuxinou Railway now offers a weekly scheduled train service. Transportation via the Yuxinou Railway saves about 20 days compared with rail/sea intermodal transport (via Chongqing-Shenzhen Railway and then by sea to Europe) or river/sea transport (via the Yangtze River to Shanghai and then by sea to Europe). According to China Customs statistics, about 85% of the total value of goods handled by the CR Express via Alashankou in Xinjiang is carried by the Yuxinou Railway. Boosted by local and foreign investment inflow, the technology industry in Chongqing and its neighbour Chengdu provides the main exports carried by the Yuxinou Railway, with goods including notebook computers, printers, LCD monitors and other IT products. Among them are brands such as HP, Acer, Asus and Toshiba. The Yuxinou Railway also carries imported goods, including auto parts and finished vehicles. The majority of the cargo is high value-added items, and requires urgent delivery. 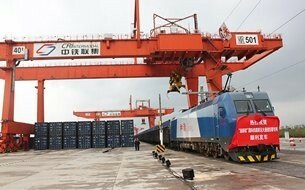 In an interview with HKTDC Research, a representative of Yuxinou (Chongqing) Logistics Co Ltd said that currently about 40% of goods carried on Yuxinou trains were exports from local enterprises in Chongqing, 30% were from East China, and another 30% were from South and Southwest China. He noted that companies could now take advantage of the Yuxinou Railway’s logistics and transportation services to deliver goods to Germany, Poland, the Czech Republic, Moscow and Cherkessia in Russia, Astana and Almaty in Kazakhstan, and then transship them to other destinations. The further expansion of related logistics services presents them with Belt and Road business opportunities in Central Asia and Eastern Europe, as well as in export markets in Western Europe. Chongqing to Duisburg, Germany: about 11,179km; about 14 days. Chengdu to Łódź, Poland: about 9,826km; about 10 days. Zhengzhou to Hamburg, Germany: about 10,399km; about 17 days. Suzhou to Warsaw, Poland: about 11,200km; about 12 days. Wuhan to Lyon, France: about 11,300km; about 15 days. Changsha to Duisburg, Germany: about 11,808km; about 18 days. Yiwu to Madrid, Spain: about 13,052km; about 21 days. Note: Train services are expected to continue to improve. For updates, please make enquiries with the relevant railway departments.